The Simpson Cup is the veteran's equivilent of The Ryder Cup. 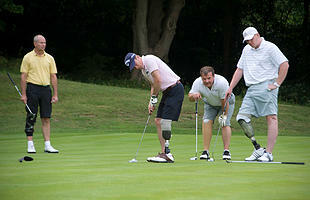 It is played by injured Service personnel who have taken up golf as part of their association with On Course Foundation. The guys that play are inspirational and pretty good golfers too! This unique opportunity is for you and two friends to be inspired by David's golf, and also to have your own golf game tested at the sensational Royal Lytham Golf Club. The round to be arranged subject to David's availability.